I’ve loved hearing from readers who are enjoying my book this week! Several have emailed me, written notes on my Facebook page, and left wonderful Amazon reviews. I’m full of gratitude and so glad that parents are reading and enjoying my book. It’s a truly awesome feeling. On top of all of that, I recorded an interview with Rachel Martin of NPR’s Weekend Edition Sunday this morning. Talk about an exciting and nerve-wracking and amazing experience. The interview will air this Sunday morning. Will your kids pipe down long enough for you to listen to it? Mine probably won’t. Thank goodness for the internet. I’ll post a link here once it’s up. For those who don’t yet have the book or are new to my blog, I thought I’d share the book’s Introduction here, so that you can get a better feel for my writing and the contents of the book. I was a scientist first. I started working in research labs as a college student, then as a lab technician, and then went on to graduate school for a Ph.D. in nutritional biology. By the time my husband and I decided we were ready for a baby, I was a postdoctoral fellow studying fetal physiology. For the previous decade of my life, I had been working to understand the world through the lens of science. I asked questions and sought answers by designing and conducting experiments in the lab. I pored over journal articles, trying to make sense of my data and figure out what important questions to ask next. My job was to measure, analyze, and explain. If I felt lost, then the way out of darkness was always to learn more, maybe by repeating an experiment or immersing myself in the scientific literature until things started to look a little clearer. It should come as no surprise, then, that when I didn’t get pregnant in the first couple of months of trying, I tackled it in the best way I knew how: with science. I measured my basal body temperature and tracked my cervical mucus. I recorded my data in a spreadsheet and searched for patterns in color-coded graphs. I pulled out my reproductive physiology textbook to brush up on ovulation and how to optimize our chances at fertilization. It’s hard to say whether any of this helped me to get pregnant any faster, but it did at least give me a feeling of control, though perhaps at the expense of romance. When I eventually did get pregnant and became a mother, this same story played out again and again, with different details. Pregnancy and childbirth were just the beginning. Caring for my daughter, Cee, brought lots more questions. Where should she sleep, and when could I expect her to sleep through the night? When should she start solid foods, and what should I feed her? Should I be worried about vaccine safety? Between feeding and rocking, changing and bouncing, and soothing and singing, I found myself digging into the science of parenting. At about the same time, I left the research lab so that I could spend more time with Cee and explore other career paths, but I missed talking about science with like-minded colleagues. 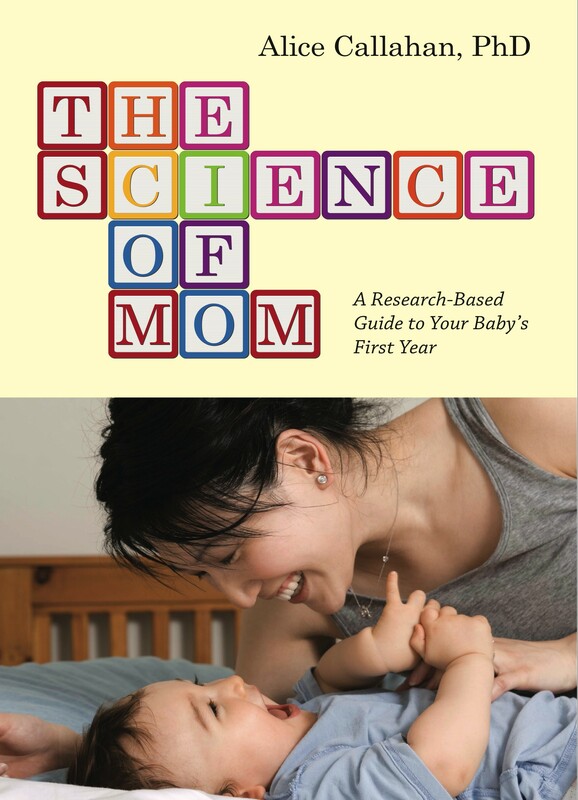 I started the Science of Mom blog as a place to share and discuss what I was learning about parenting, and I was thrilled to find a community of equally inquisitive parents looking for solid science. My blog readers were fascinated by the complexities of the science and always ready with new questions, which inspired me to keep researching and writing. At some point, I wanted to be able to develop these topics in a more cohesive manner, and that journey became this book. Why do we look to science for answers to parenting questions? For most of human history, how we cared for our babies was passed quietly from generation to generation, one mother to the next. It varied around the world, and it changed over time, but it was informed by culture, environment, and necessity–not science. But for our generation, new parenthood means making a huge number of decisions with little familial or cultural guidance. Most of us live far away from the parents and grandparents, aunts and uncles, and brothers and sisters who might have guided us into parenthood in generations past. Instead, we have unlimited advice from the Internet, a resource that empowers us to find our own answers but at the same time overwhelms us with confusing information. If our babies won’t nap or we’re struggling with breastfeeding, we can ask Google for answers or solicit opinions from social networks like Facebook and Twitter. Very quickly, we find ourselves in a minefield of conflicting information and opinions, often paired with a little judgment from all sides. Science is a tool that can help us get closer to the truth in the midst of all this confusion. It can help us to sidestep the opinions and philosophies and anecdotes that fuel parenting debates. We look to science, not to confirm what we want to believe or to prove others wrong, but rather to make the best decisions we can as parents. It isn’t that science has all the answers to our parenting questions. For some questions, like those that are medical in nature, science can be a great guide. For others, like parenting practices, it can often only give us clues that we then have to figure out how to apply to our own families. The truth is, from a scientific standpoint, parenting is an immensely complicated thing to study. How do we sort through and quantify so many variables–along with all the differences between babies and families–and, statistically, make some sense of it all? Something so complex can rarely be reduced to a right way and a wrong way. What science can do is zoom out to look at large numbers of babies and families to reveal patterns and averages and ranges of normal. It can give us a broader perspective that can be hard to find during the day-to-day tasks of caring for a baby. It can reveal risks and benefits that we may not have considered, allowing us to approach decisions in an objective way. Science may not offer a protocol for parenting, like the procedures that I perfected in my research lab, but it can help us make smart decisions for our families. Science can also help us rise above parenting controversies. In many cases, if you carefully study the data, as I did in my research for this book, you see that there’s rarely a strong case for everyone doing things in the same way. There’s plenty of room for parents to make different choices about how their baby eats and sleeps, for example. When you understand the limitations of the science, you are empowered to follow your heart and your child’s lead. And in cases where the science gives us a clearer answer, it can help us make decisions more confidently. We don’t have to waste our energy arguing or defending ourselves, because we’ve looked at the evidence, and we’re comfortable with our choices. This frees up valuable time and energy to focus on our babies, take a nap, or work on things important to us instead of scouring conflicting Internet articles for nuggets of truth. I begin this book, in chapter 1, with a sort of crash course in evidence-based parenting. If we want to examine parenting decisions in a scientific way, then we have to understand how science works, how to parse through many studies to find the most relevant ones, and how to interpret research in a meaningful way. This outline will give you an idea of how I approached each topic in this book, and it should also prepare you to tackle your own questions with science as your guide. In chapters 2 and 3, I zoom in on a few medical questions important to newborn babies, including when we should cut the umbilical cord and why newborns receive an injection of vitamin K and a smear of antibiotics in their eyes. These may be small questions in the scheme of a baby’s first year of life, but they each provide a fascinating case study in the history and science of newborn medicine. In chapter 4, I step away from decision-making and appreciate new babies as scientists do, for their incredible abilities to sense and explore their new world with touch, sound, sight, and smell. Understanding our newborns sets the stage for how we care for them responsively and how the parent-child relationship develops over time. In the rest of the book, I examine some of the biggest questions and sources of angst for parents: breast and bottle-feeding (chapter 5); sleep safety and bed sharing (chapter 6); baby sleep patterns (chapter 7); vaccine safety (chapter 8); starting solid foods (chapter 9); and healthy nutrition for the older baby (chapter 10). As I researched and wrote each chapter of the book, I read hundreds of scientific papers, talked to scientists, and interviewed parents for their real-life stories. I looked for answers, but I also wasn’t afraid to investigate and question the parts of science where things are still uncertain, and that is often where I found some of the most interesting stories. I didn’t write this book pretending to be a parenting expert. I am just a mom with big questions, and I had the scientific training and the curiosity to dig for the answers. I didn’t set out to argue one side or the other on controversial topics. Instead, I’ve tried to be honest about what the science does and doesn’t tell us, even when that might be different from the simplified recommendations handed down to us from parenting authority figures. I loved getting buried in convoluted literature searches, trying to find some kind of truth that could be useful to you and me. Thanks for coming along on this journey with me. I hope it makes your job as a parent a little easier–and maybe more interesting, too. 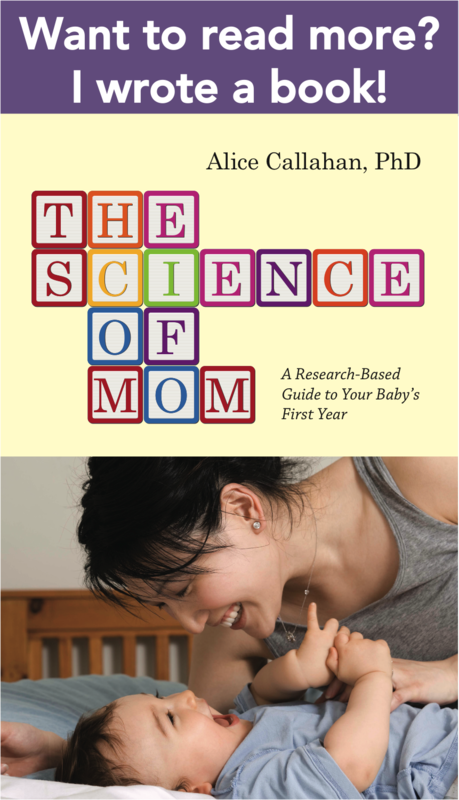 From The Science of Mom: A Research-Based Guide to Your Baby’s First Year, by Alice Callahan. Published by Johns Hopkins University Press. Reprinted by permission of the publisher. You can order my book from any of the following sites: Johns Hopkins Press (use discount code HNAF for 30% off), Amazon, Barnes and Noble, Powell’s, Indigo, Kobo, and Indiebound – or order it through your local independent bookseller. 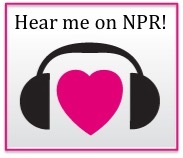 I just heard your inierview on NPR. You did such an amazing job and I am so happy for you and your success. You deserve all the best and it was great to hear your voice. Even though I’m not even expecting a kid in the next few years, nor am I a mom, the introduction definitely sounds like I’ll be saving this page and buying the book in a few years!